July 09, 2006, LG Crabo. 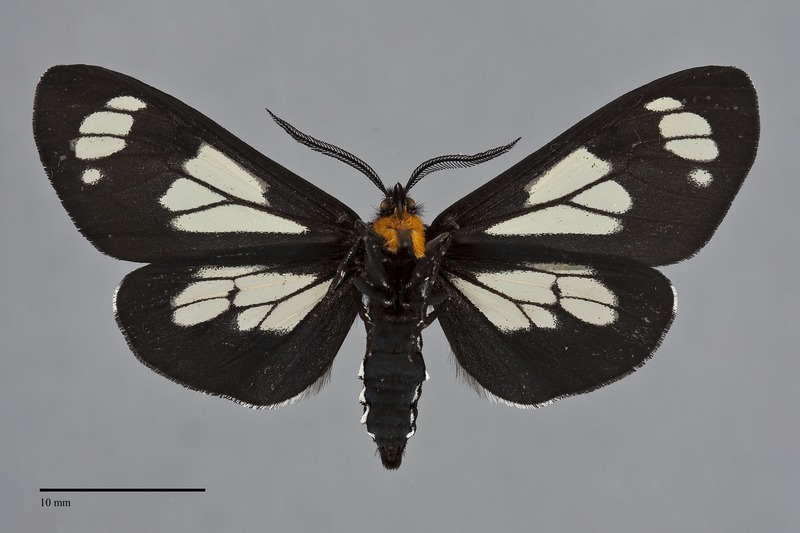 Gnophaela vermiculata is a distinctive moderately large (FW length 20 - 25 mm) black and pale diurnal tiger moth. The forewings are elongate with slightly squared off outer margins near the apecies. They appear black with translucent greenish yellow areas between the veins in the median and subapical areas. The hindwings are similar, with the pale areas in the anterior portion of the basal and median wing. The head and thorax are black with white dots on the collar, tegulae, and wing bases and the proximal forelegs are bright orange. The abdomen is shiny bluish black with a row of white spots on each side. The antennae are bipectinate, strongly in males and weakly in females. This species is only likely to be confused with Gnophaela latipennis which occurs in western Oregon in our area. 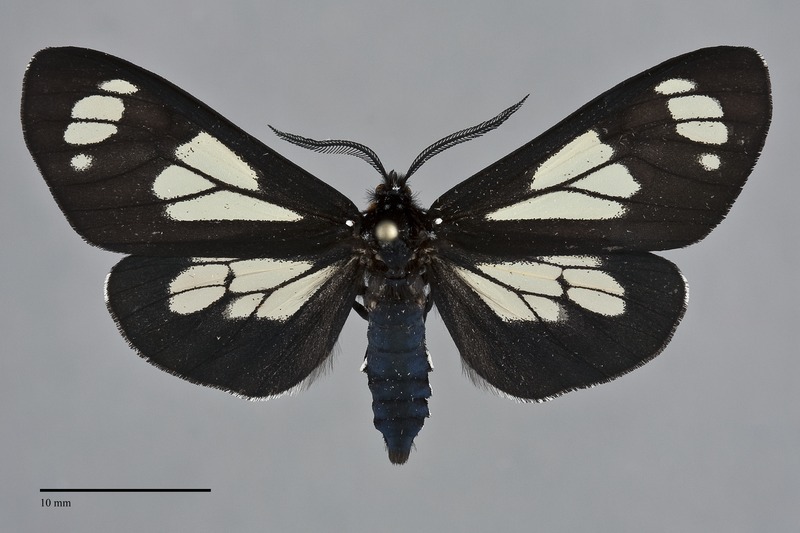 This species has more limited pale areas on both wings, readily apparent in the illustrations, and has more rounded forewing margins. Larva is covered with tufts of hairs, black with lateral yellow patches. This species is common and widely distributed in the Rocky Mountain region, but colonies tend to be locally sporadic and disjunct in moist mountain meadows, open forests, and in riparian zones along creeks. Gnophaela vermiculata is found in montane forest in most of our region, being absent from western and southern Oregon and all but southern British Columbia. This species is found in the Rocky Mountain region from the Pacific Northwest south to southern New Mexico. It occurs in northeastern Nevada but it is not recorded in California by Ferguson et al. (2000). The range extends east to western Manitoba across the central Canadian Prairie Provinces. This species is a foodplant specialist feeding on mountain bluebells (Mertensia spp.) in the Boraginaceae. Larvae were observed by Lars Crabo congregating to pupate in between rocks on a rock wall near Chinook Pass, Washington on July 9, 2006. Adults of Gnophaela vermiculata are diurnal and are found in wet forest meadows at middle to high elevations. Adults are on the wing from late June to early fall. Their flight is fairly slow and they nectar at flowers making them easy to net.